The Dar es Salaam building collapse occurred during the early hours of Good Friday on 29 March 2013 when a 16-floor residential apartment building collapsed on a nearby mosque compound, killing 36 people and trapping over 60 under the rubble. The building was owned by Raza Huseein Damji with the National Housing Corporation (NHC) having a 25 percent share in the project. Poor building design was the suspected cause for the collapse, Kheri Kessy, the Deputy Mayor of Ilala said in 2007, as the approved plan was for a 10 floor apartment building project. The project inspector ensured protocol was followed but when the ten floors were completed the oversight responsibility changed to a different governmental body. The Contractors Registration Board (CRB) Engineers Registration Board (ERB) claimed a stop order was issued when the building exceeded the 10 floor plan approval. The plan limitation was ignored when at the time of collapse there were 16 completed floors and another projected 3 floors to be constructed. Substandard concrete and steel bar reinforcement were cited as reasons that led to the collapse. The Tanzanian Red Cross expressed relief that the casualty figures could have been far higher but the streets were relatively empty of vendors and shoppers due to the holiday. President Jakaya Kikwete who visited the site expressed his sorrow and tweeted his prayers for those afflicted by the tragedy. On a second visit the next day, he ordered for strict supervision of construction projects. “The municipal Chief Engineer, Ilala District Chief Inspector of buildings, owner of the building and whoever is connected to the scam must face justice,” Kikwete ordered. Dar regional police chief, Suleiman Kova, said, "the owner of the building would be held responsible and taken to task". Weeks after the incident, in the parliament budget speech, Prof Kulikoyela Kahigi said that the government should bear the blame, considering the fact that former Prime Minister Edward Lowassa formed a task force in 2006 to investigate the state of buildings under construction but its recommendations were ignored. Out of the 36 people killed in the collapse, 25 were identified of which were 4 children and 21 adults. The children were all students of the Al Muntazir School  who were playing soccer near a mosque after morning prayers. They were identified as Salman Damji, Yusuf Khaki, Zahid Kanji and Suheil Karim. Other victims include Kulwa khalfan, Hamada Mussa, Kessy Ally Manjapa, Hamis Zuberi Mkomwa, Boniface Bernard, Seleman Haji, Seleman Mtego, Sikudhani Mohamed, Ahmed Salum Mirambo, Salum Issa Mapunda, Selemani Rashid Mnyani, John Mtyani Majewa, Mussa Ally Munyamani, David Severin Helman, William Joackim, Abdulhaman Othman Mwiha, Emmanuel Christian, Mmanyi Jumanne Ngadula, Advai Mpinge Desiki, Emmanuel Grayson Wahai and Augustino Kanisius Chuma. At the behest of Kikwete, three municipal officials and the engineer were held for questioning over the incident. This was increased to include the owner Raza Damji and his son, Aly Raza Damji. Vedasto Ferdinand, a quantity surveyor was also arrested. The owners' son who was also arrested was let go for unknown reasons. The suspects were remanded until 16 April pending a bail ruling. On 16 April, the magistrate court justice Devotha Kisoka issued bail to the eleven suspects. The conditions of the bail required each of the accused to secure two reliable guarantors, who would have to sign a bond of 20 million Tanzanian shillings (~12,300 USD) each and bring along formal letters of introduction from their local governments. The suspects were also ordered to surrender all travel documents and not leave the city without informing the court. ^ "AllAfrica- Tanzania: Rescue Efforts Called Off As Death Toll Reaches 36". Archived from the original on April 8, 2013. Retrieved April 27, 2014. ^ "TheCitizen- Boy, 15, lucky to be alive after friends die in Dar building horror". Archived from the original on April 8, 2013. Retrieved April 27, 2014. ^ "CNN- Rescuers dig through rubble seeking missing in Tanzania building collapse". 29 March 2013. Archived from the original on 8 April 2013. Retrieved April 27, 2014. ^ "BBC- Tanzania: Dar es Salaam building collapse 'kills 17'". BBC News. 30 March 2013. Archived from the original on 8 April 2013. Retrieved April 27, 2014. ^ "News.Com.Au- Two Dead in Building Collapse in Dar es Salaam". Archived from the original on April 8, 2013. Retrieved April 27, 2014. ^ "Xinhuanet- Over 60 trapped in collapsed building in Tanzania's Dar es Salaam". Archived from the original on April 8, 2013. Retrieved April 27, 2014. 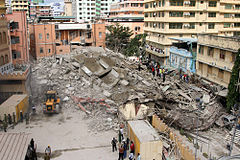 ^ "Nation Kenya- Dar es Salaam building collapse toll hits 25". Archived from the original on April 8, 2013. Retrieved April 27, 2014. ^ "DailyNews- Death toll reaches 30 as survivor recounts ordeal". Archived from the original on April 8, 2013. Retrieved April 27, 2014. ^ "DailyNews- Death toll reaches 20 as Kikwete acts tough on contractors". Archived from the original on April 8, 2013. Retrieved April 27, 2014. ^ Mwananchi Swahili News“Kama nilivyosema,sisi tulitoa kibali cha kujenga ghorofa 10 na mkaguzi wetu alikagua hadi ghorofa ya 10 hivyo kama waliendelea kujenga sisi hatujui kwani kuna CRB (Bodi ya Usajili wa Makandarasi) au ERB (Bodi ya Usajili ya Wahandisi) wao ndio wanahusika zaidi watawaelezeni,” alisema Kessy. ^ Simbeye, Finnigan Wa (1 April 2013). "Tanzania: Poor Workmanship to Blame As High Rise Building Collapses". Retrieved 27 January 2017 – via AllAfrica. ^ CNN, Mwondoshah Mfanga, for. "Rescuers dig through rubble seeking missing in Tanzania building collapse". Retrieved 27 January 2017. ^ "Jakaya Kikwete on Twitter". Retrieved 27 January 2017. ^ "Tanzania building collapse death toll rises". Retrieved 27 January 2017. ^ Kazoka, Ludovick (2 April 2013). "Tanzania: Rescue Efforts Called Off As Death Toll Reaches 36". Retrieved 27 January 2017 – via AllAfrica. ^ "Tanzania: Suspects in Dar es Salaam Building Collapse Released On Bail". 18 April 2013. Retrieved 27 January 2017 – via AllAfrica.